By the time this post is published, Wikipedia (the English site) will not be accessible. That’s right, the place where you go to gather preliminary information on everything from the history of the letter “A” to breaking down the MBLAQ acronym will be blacked out on January 18, 2012. When you go to the community-driven Internet-based encyclopedia, all you will see is a black screen. That means for 24 hours, you won’t be able to access quick biographical information about Shakespeare or Martin Luther King, hear what a kayagum sounds like, or see the latest geographical or cultural statistics of Taiwan.Why? Because the site, along with other companies like Google, Facebook, Twitter, and LinkedIn, are actively protesting the proposal of pieces of legislation called SOPA and PIPA. 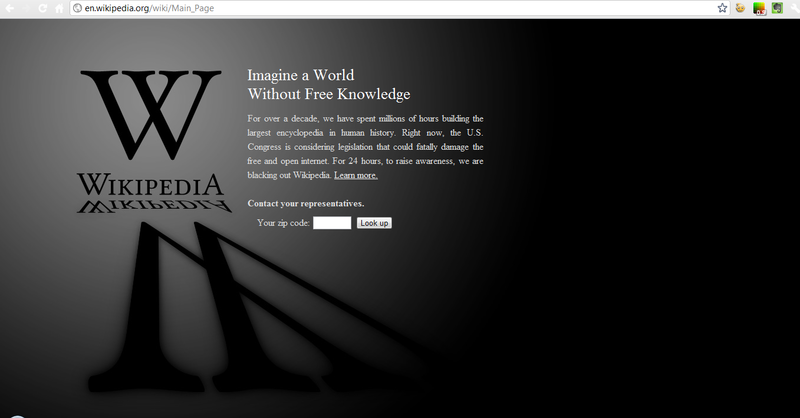 Wikipedia implementing a 24-hour Black Out to protest proposed SOPA/PIPA legislation (January 18, 2012). SOPA is an acronym for the Stop Online Piracy Act (PIPA = Protect Intellectual Property Act). It was created as a way to guard American intellectual property. When Americans re-use or re-send intellectual property that doesn’t belong to them, they may face criminal or civil consequences. Right now, that doesn’t happen to non-Americans who do the same thing. SOPA is an attempt to ensure that non-Americans also fall under the same rules if they use American intellectual property without permission. But think about whom in America actually “owns” intellectual property. Large companies! For example, as a faculty member, I have to write articles about my work and research, and they have to be published. Even though the work is mine, I don’t get any royalties when people subscribe to the journals I wrote for, nor do I get a royalty check when a chapter I wrote ends up in a book that sells well. The publisher gets all the money for my work. I see none of the profit! This doesn’t happen in all cases, but consider in the pure profit arena of music, for instance, how little return a musician actually sees on their return for a double or even triple platinum album. Right now, no matter who you are on the Internet (American or not), if are told to take something down because it violates copyright, and you follow the directive, that’s it, no harm no foul (and if you don’t, your YT account, for instance, would be suspended). Under SOPA, a company would be liable for any copyright violations on its site. That means if a Korean YT user uploads a video file with doubtful content, YT would be in trouble for not making sure that content was free of copyright infractions, thus the YT website could be shut down. Or, say you put a link from MySoju.com on your website, and the content infringes on copyright. Under SOPA, your site could be shut down by a court order for merely having the link, even though you are not the originator of the infringed content! So you can imagine what this means for scores of Kpop information outlets, which oftentimes link to unsourced photos, images, videos, television programs, articles, blurbs, Korean newspapers (which may have different reporting and intellectual property standards) and a maze of other places. Suffice it to say that SOPA and PIPA could cause the end of research and inquiry into a variety of areas (Wikipedia is a great equalizer in the gathering of knowledge – consider all those websites that are used to verify information in the entries!) and block access to an untold number of sites that provide the Internet community (scholars, doctors, teachers, students, laywers, grandparents, the recently diagnosed, the recently displaced, the knowledge-for-knowledge-sake seekers, YOU) with information needed to live their daily lives or do their work. Here at the KPK, we know that, above all, Hallyu lives on the Internet, and if SOPA were to pass, the Internet is where Hallyu could die, because at the end of the day, the proposed bills effectively stop the free flow of information. 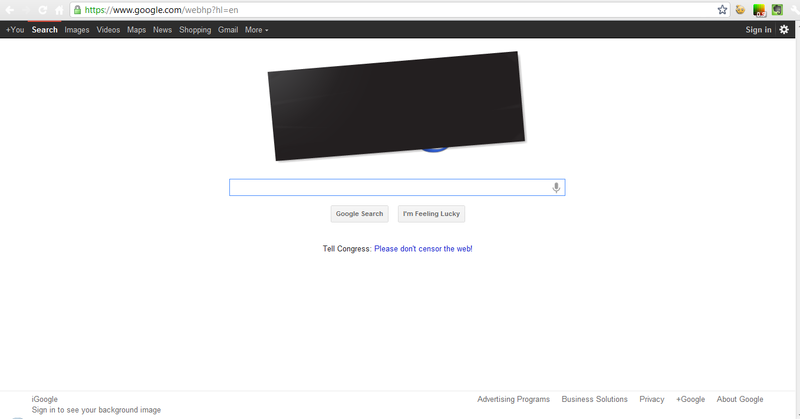 Google blacks out its banner to protest proposed SOPA/PIPA legislation (January 18, 2012). To be clear: if SOPA/PIPA pass, many websites you use in pursuit of your “Hallyu Habit” (not to mention other, more pressing information needs – health, anyone?) could be blocked. Further educate yourself on these bills (Review the actual bill; read more about effects here). If you agree with arguments against these bills, sign the petition. Contact your representative and tell them how you’d like them to vote (i.e., how to represent you when it comes to this issue). Continue to be watchful of attempts to take away, stop, or punish those who engage in the free (as in liberty) and equitable information flow. As a librarian and a scholar, I am against this legislation. I intensely believe that because knowledge is power and empowering, everyone has a right to it. What do you think of SOPA? Do you think it will pass? If so, then what? Leave a comment! Yes, let’s work to keep the internet a free, public space (I like Lewis Hyde’s Common as Air argument on this). By the way, WordPress is also protesting SOPA and PIPA. If you go into “Settings” they have some options for protesting. One is to black out the entire website, the other is to put a black ribbon in the upper right corner. I did it for my blog! The ribbon will stay up until the 24th. Hello! KPK is constantly changing to support its mission, which foremost is to create a consistent and trusted scholarly space for the serious discussion of Korean popular culture. In fact, the digital essays like this one and others housed on this site is one of the primary ways KPK members engage and extend deeper discussion to fans and academics of Hallyu. To that end, unless the digital essay is framed as a Visual one (where media is primarily used to illustrate a point), the hallmark of the KPK digital essay is fundamentally excellent scholarly writing. Therefore, visual media are used to support the points of the essay rather than dominate the text. Thanks for supporting KPK and for your comment!